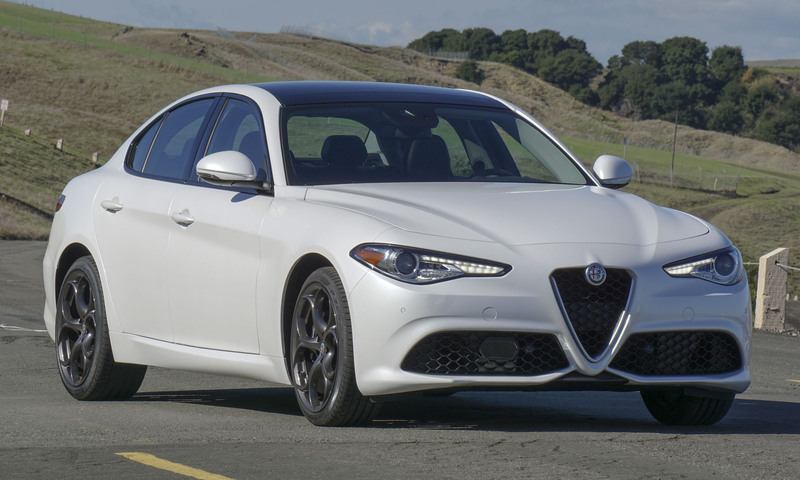 Since 2012, when parent company Fiat (now Fiat Chrysler Automobiles) announced the return of the Alfa Romeo brand in America, those close to the auto industry have been hearing about big plans for Alfa in the States. Until now we’ve only seen two low-volume sports cars, but that’s about to change with the arrival of the all-new Giulia (pronounced Julia). 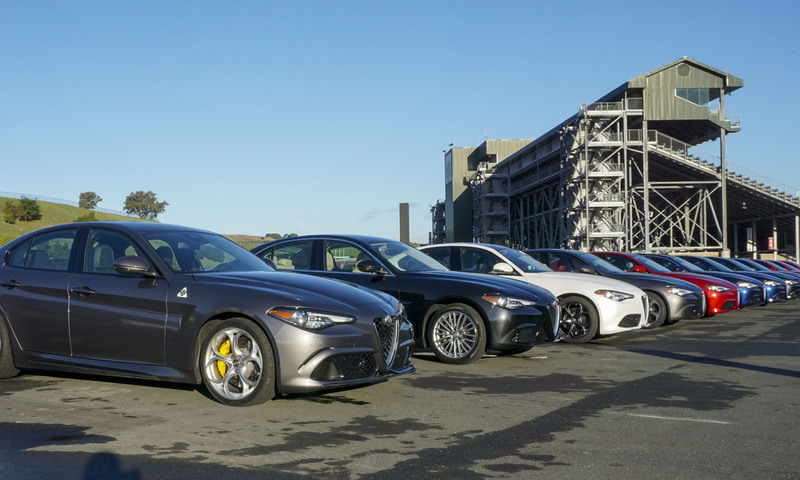 This exciting Italian sport sedan is already on sale in Europe, and later this year American buyers will finally have the chance to get behind the wheel. 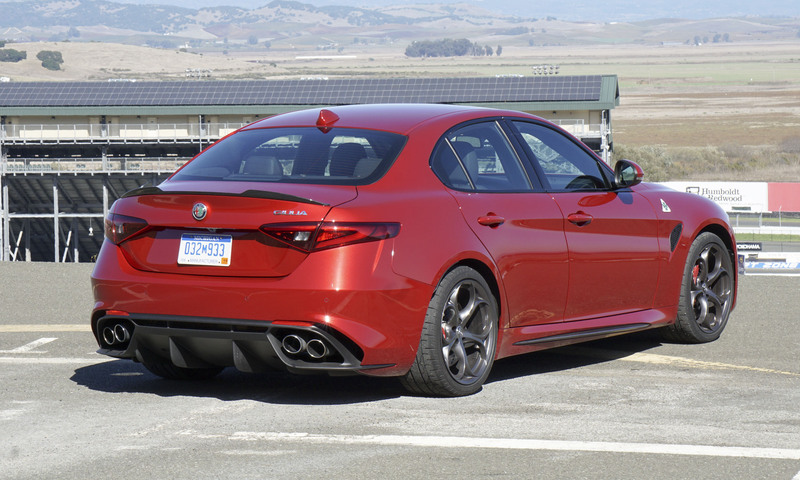 Since we recently did that, we can honestly say Giulia has been worth the wait. 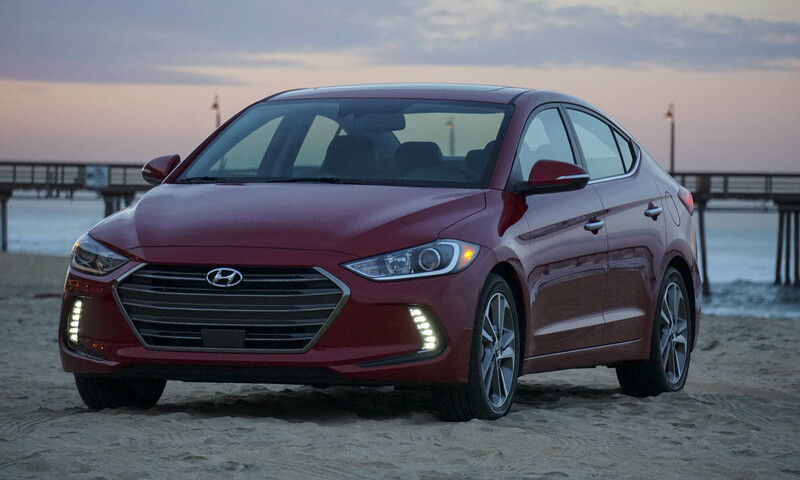 This is not simply another high-performance sedan. 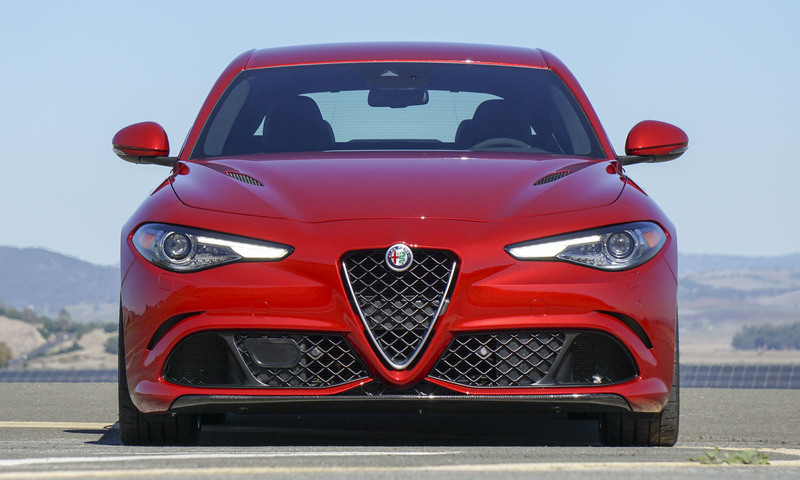 The Giulia Quadrifoglio lapped the famed Nurburgring race circuit in Germany in just 7 minutes 32 seconds — the fastest time ever recorded by a 4-door production sedan. 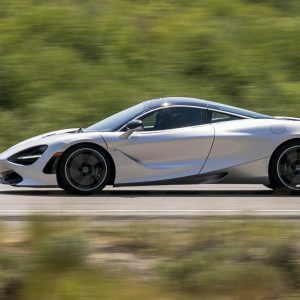 This impressive feat was accomplished with a completely stock car, and the time is quicker than exotic sports cars such as the Koenigsegg CCX and only 3 seconds behind the vaunted Porsche Carrera GT. 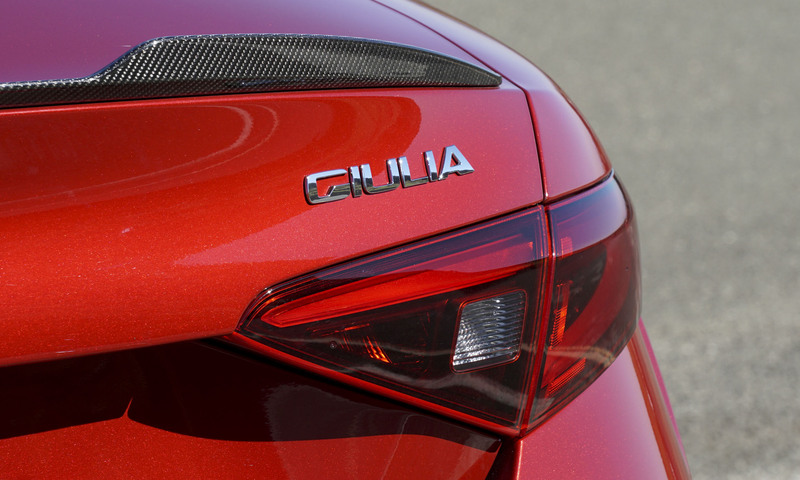 The new Giulia is available in three trims: Giulia (base), Ti and Quadrifoglio. Pricing has not been released — check this review periodically; we will update prices once received. 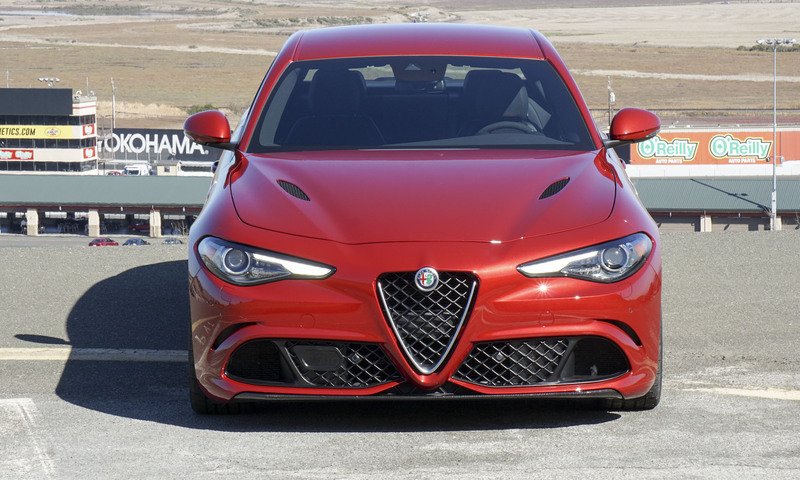 Both Giulia and Giulia Ti are also available with the Q4 all-wheel-drive system, while the Quadrifoglio is strictly rear-wheel drive. 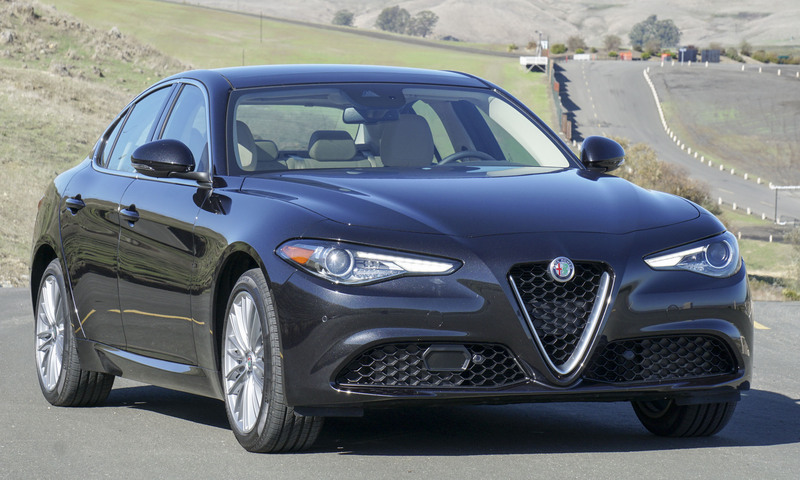 The base trim of the Giulia comes well-equipped. 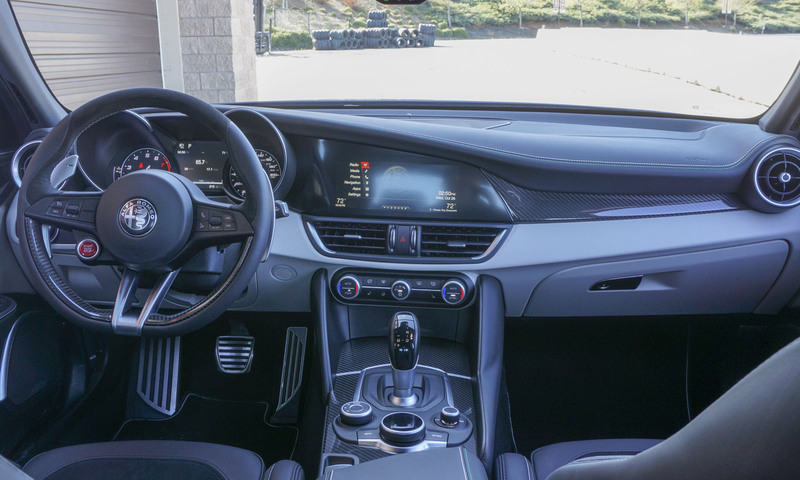 With a base price of $37,995, the Giulia has standard leather seats, a 6-way power front seat, dual-zone climate control, a 6.5-inch color display with an 8-speaker audio system featuring HD Radio and Bluetooth streaming. 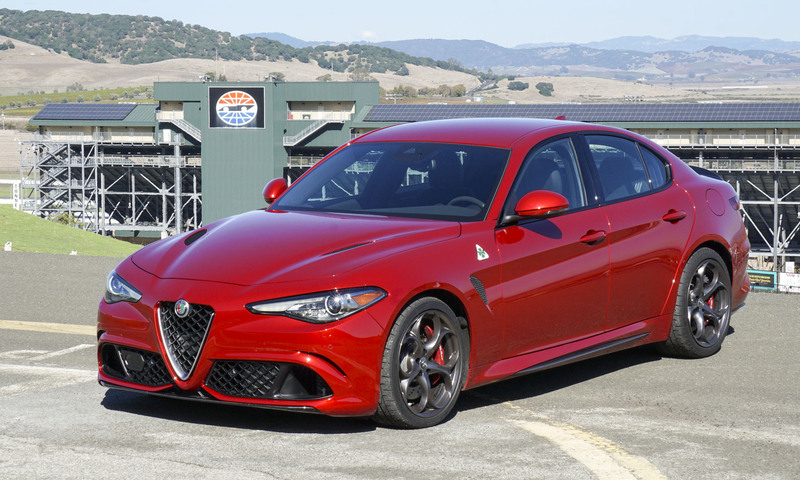 Also included are 17-inch aluminum wheels, run-flat all-season high-performance tires, Brembo 4-wheel disc brakes, bi-xenon headlights and LED running lights and taillights to give the Giulia a premium look. 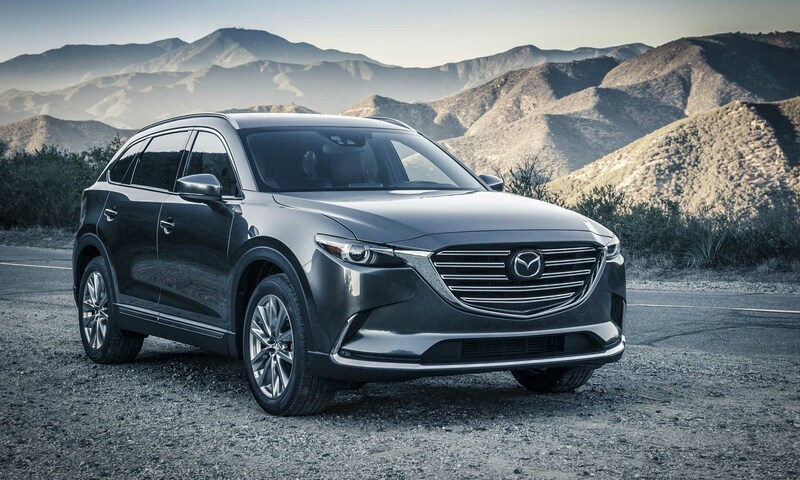 For an additional $2,000 you can upgrade to the mid-range Ti which adds heated front seats, a heated steering wheel, dark gray wood accents, an 8.8-inch color display and 18-inch Dark Turbine aluminum wheels. 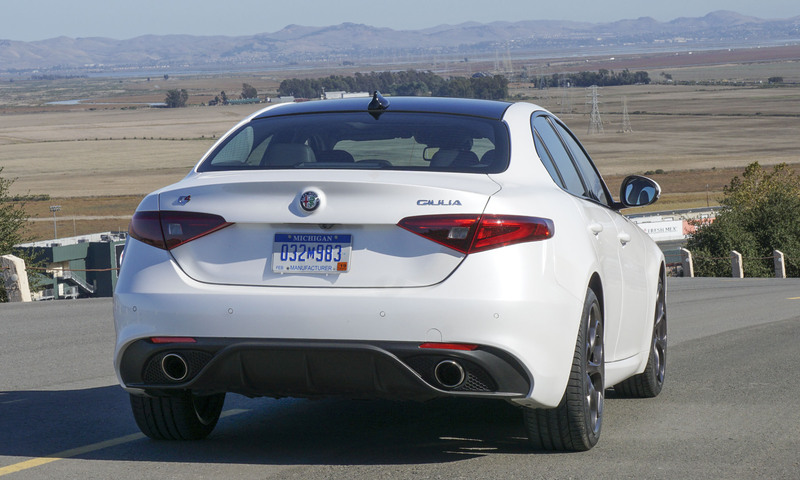 Both the Giulia and Giulia Ti can be upgraded with a Sport Package that adds a unique sport fascia both front and rear, black window surrounds, painted brake calipers (red, black or yellow), steering-column-mounted paddle shifters, and 18-inch Sport Aluminum Wheels (base) or 19-inch dark f-hole aluminum wheels (Ti). The Ti also gets sport leather seats with side bolsters. The Sport Package adds $1,250 to the base model, $2,250 to the Ti. For sport sedan shoppers looking for something with more of a luxury look, the Lusso package can be added to the Giulia Ti. Priced at $2,250, the Lusso features dark gray oak or light walnut trim, luxury leather seats, an 8-way power front seat, a leather-wrapped dash with accent stitching and 18-inch 10-spoke aluminum wheels. It may have the same basic look as the other Giulia trims, but the Quadrifoglio is another beast altogether. And beast is the appropriate term. 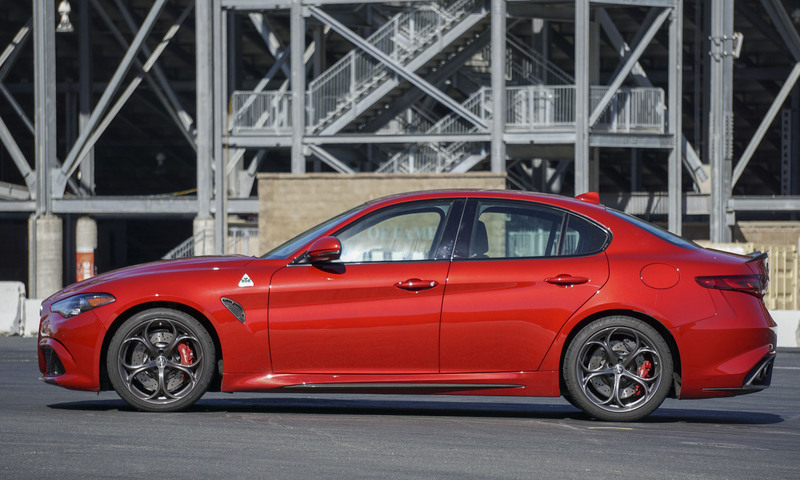 In addition to the powerful V6 engine, the Quadrifoglio gets leather/Alcantara sport seats with side bolsters and thigh support, 8-way power front seats, heated front seats, carbon fiber interior accents and 19-inch bright Technica aluminum wheels. 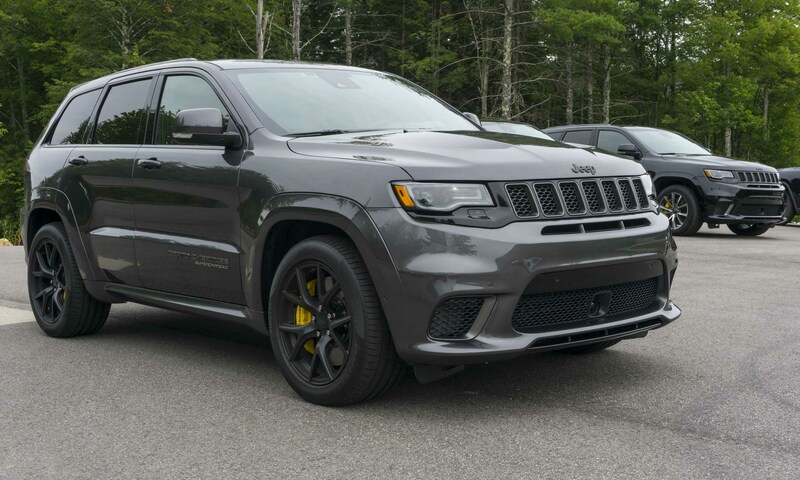 Also standard are the bi-xenon headlights, dual-mode quad exhaust, high-performance Brembo brakes with red calipers and carbon fiber active-aero front splitter. 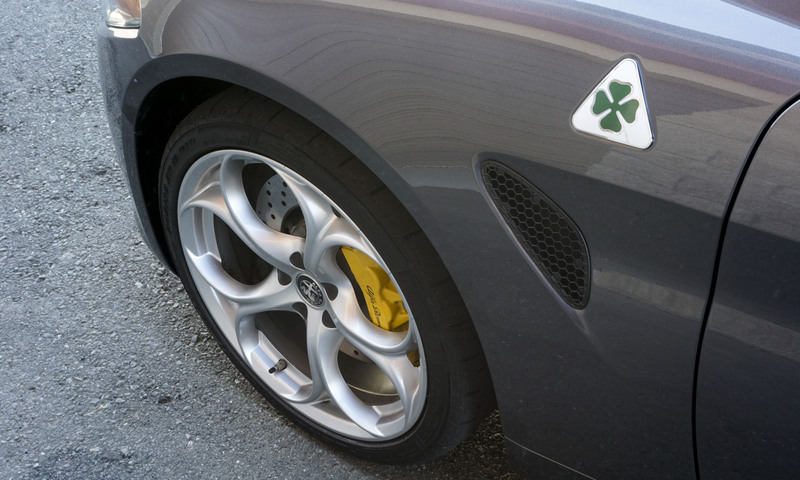 Base price for the Quadrifoglio is $72,000. 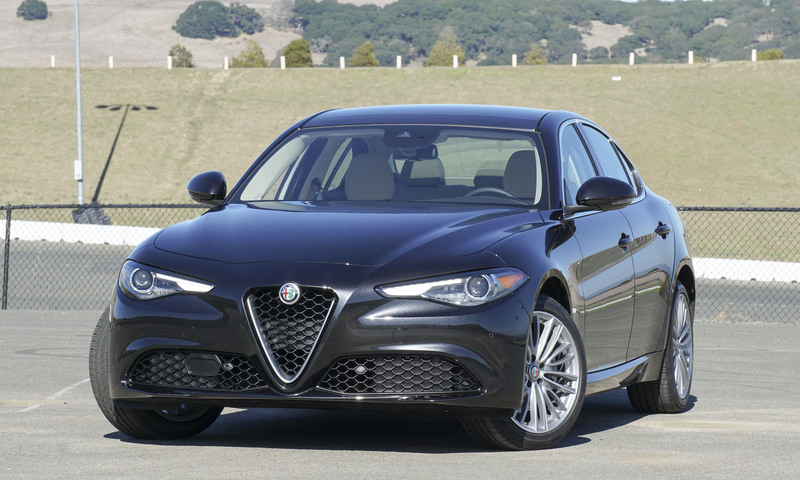 Leather trim is standard on all Giulia models; however, the seat style does vary depending on the trim and package level. 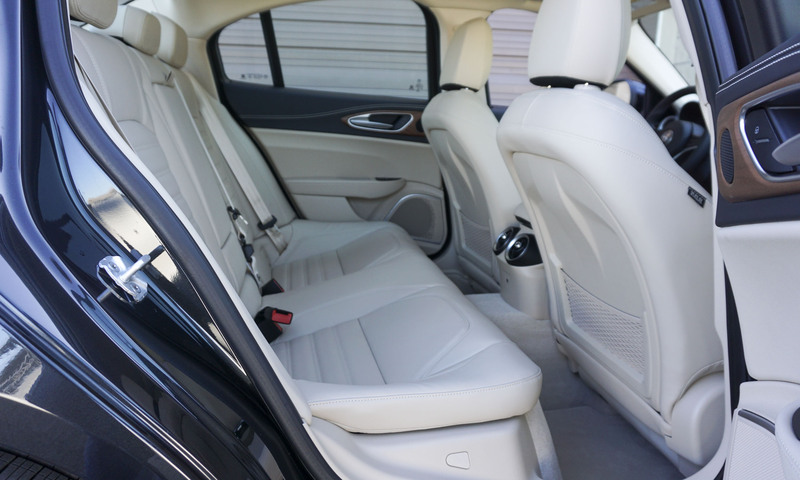 The leather seats in the Ti offer a good level of support and are quite comfortable. The steering wheel is thick and feels good — the flat bottom and integrated start button are a nice touch. The Start button is black on the base and Ti, and red on the Quadrifoglio. 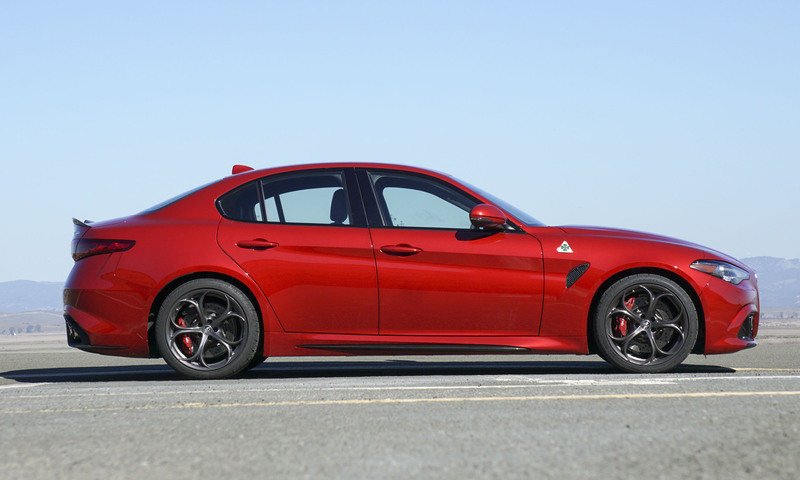 The high-performance Quadrifoglio gets sport seats trimmed in leather and Alcantara — these offer considerably larger side bolsters for the back and thighs. Large-stature passengers might find these to be a tight fit, but the seats feel snug and comfortable. Rear seats offer reasonable legroom for two passengers, and the deep seats are nice. However, the middle seat would not be very comfortable, since the occupant would have to sit on a hump with very little legroom. The dash offers a clean design with stitched leather and wood trim in the Ti — the Quadrifoglio swaps the wood for carbon fiber. There’s a decent amount of storage in the cabin with a large glovebox and cubby under the center armrest. The center stack has additional space for drinks or a phone. 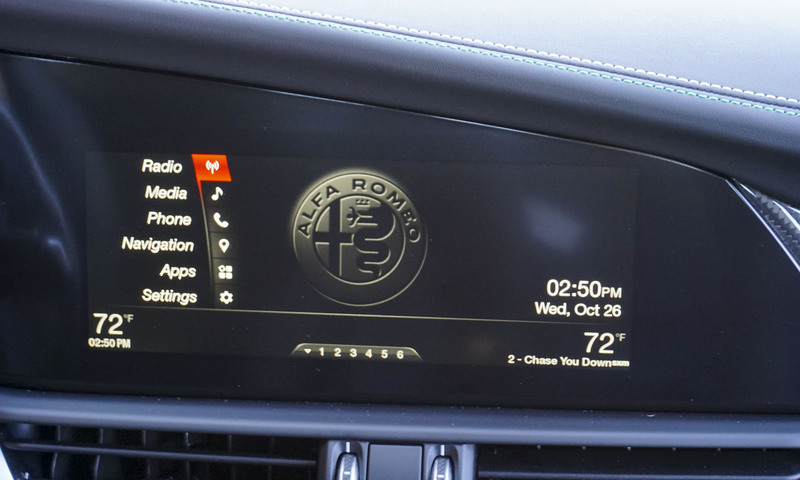 The display screen has a black background so it feels much more integrated with the dash than many other vehicles. A dial in the center console provides control over all settings and functions in the display. A separate volume control knob is a welcome feature. 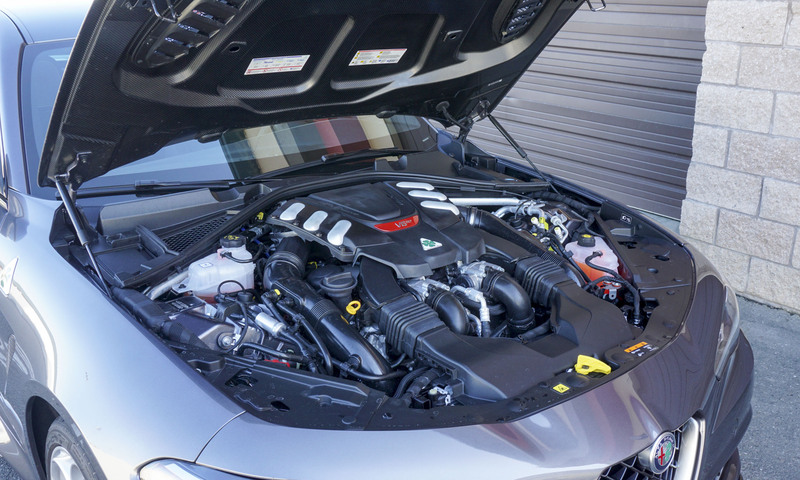 The Giulia and Giulia Ti are powered by an all-new aluminum 2.0-liter turbocharged 4-cylinder engine producing a respectable 280 horsepower and 306 lb-ft of torque. 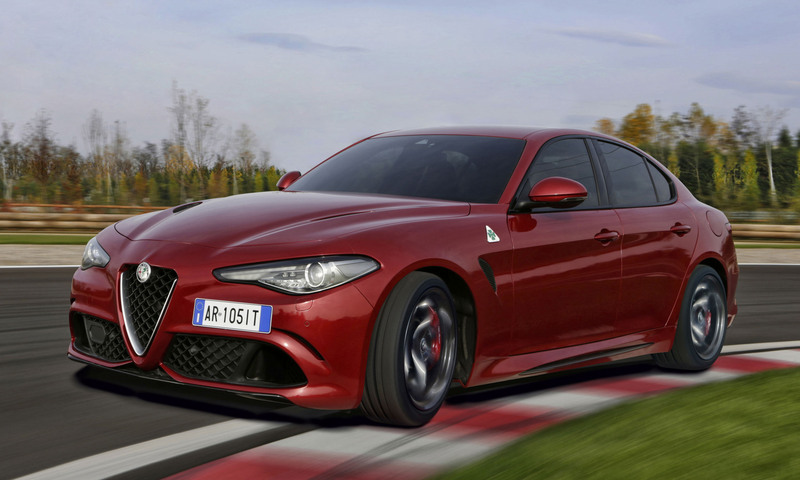 According to Alfa Romeo, this is enough oomph to reach 60 mph in around 5 seconds, with a top speed of 150 mph. 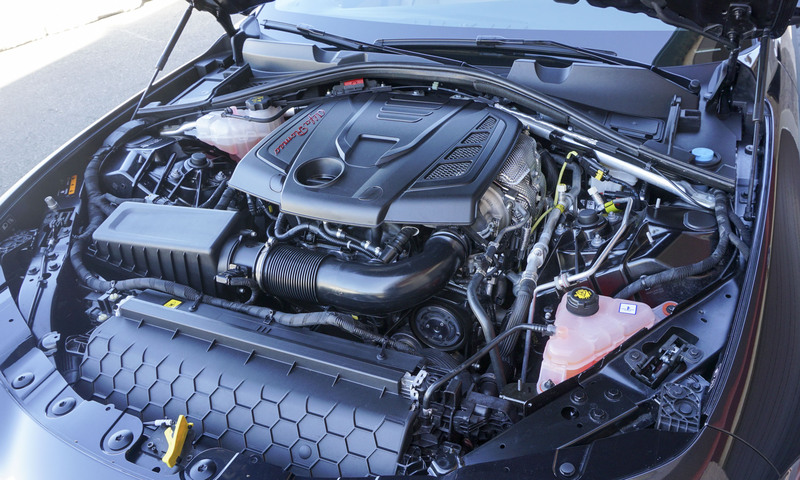 Not bad for a base-level engine. Powering the top-of-the-line Quadrifoglio is a 2.9-liter bi-turbo V6 engine rated at 505 horsepower and 443 lb-ft of torque, which is available as low as 2500 rpm, making this the most powerful production car ever from Alfa Romeo. The sprint to 60 mph takes a mere 3.8 seconds on the way to a top speed of 191 mph. 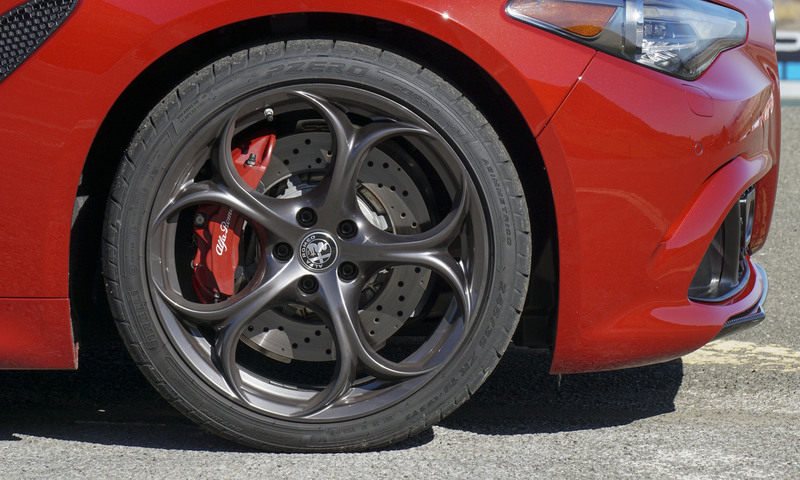 With Brembo 6-piston front and 4-piston rear brakes, stopping power is equally impressive — it takes just 102 feet to stop from 60 mph. 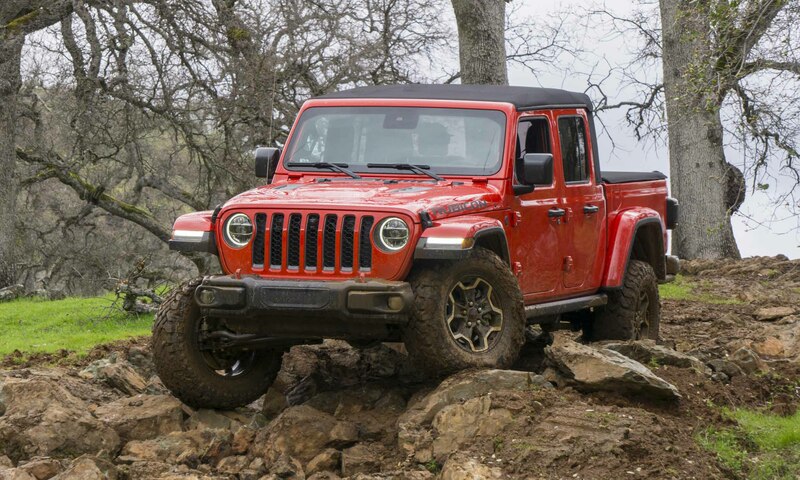 Both engines are teamed with an 8-speed automatic transmission that performs shifts in around 100 milliseconds — one of the fastest-shifting automatics we have experienced that isn’t using a double-clutch system. Gear changes can be performed via paddle shifters or the transmission can shift on its own. 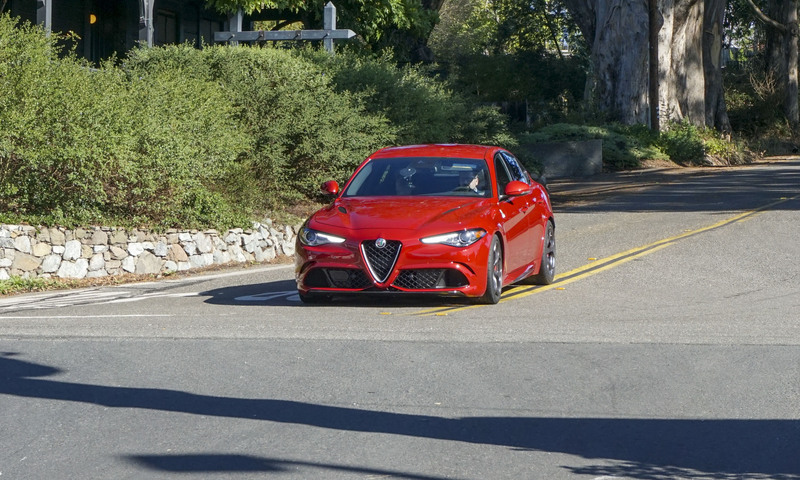 We had the opportunity to drive the Quadrifoglio and Ti on a variety of twisting roads and freeways in Napa, California. 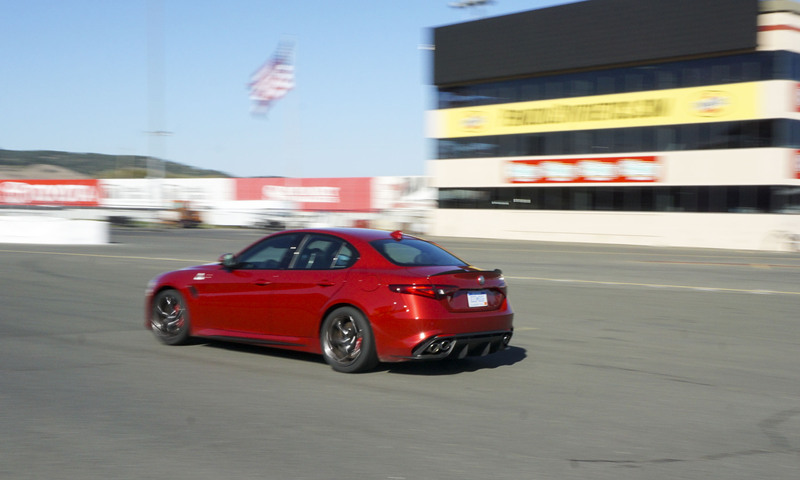 In addition, we drove the Quadrifoglio on the NASCAR course at Sonoma Raceway. 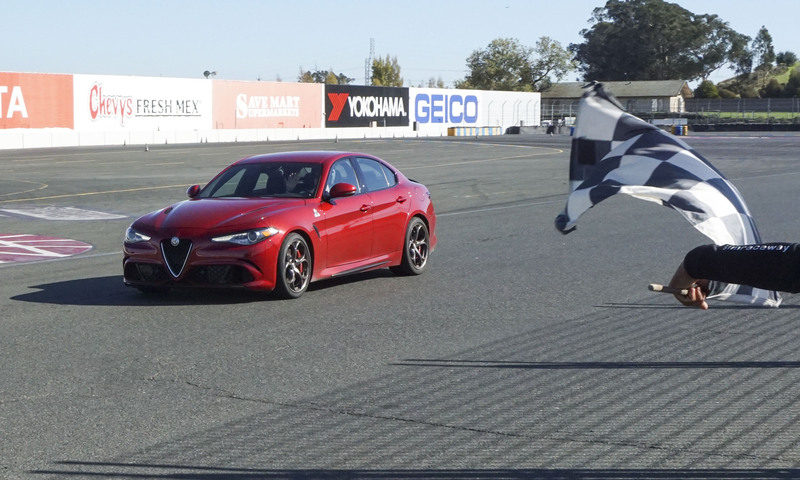 After some hot laps, we can confirm the Giulia is capable of extreme performance while still filling the role of daily driver. 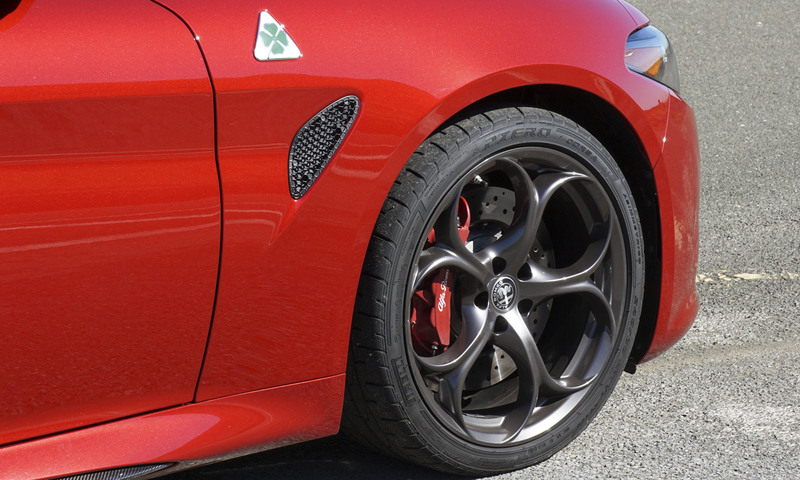 With 505 horsepower on tap, the Quadrifoglio accelerates quickly with little effort. On track we didn’t encounter any situation in which we were lacking power. In fact, the transmission practically overshadowed the powerplant. 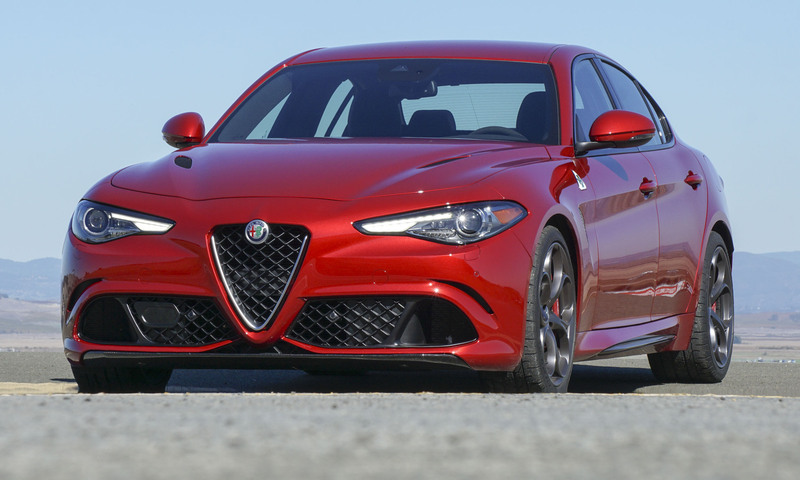 Yes, as auto journalists we were pining for an actual manual transmission, but it is a losing argument with an automatic as good as the Giulia’s. Activating the paddle shifters results in instantaneous up- or downshifts, although the transmission works so well on its own that we eventually left it in automatic mode most of the time, even on the track. 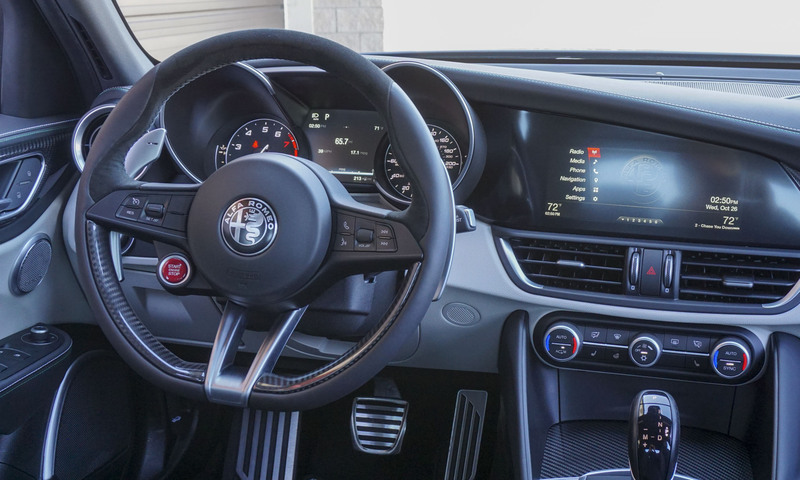 The Giulia’s steering feel is among the most precise we’ve ever experienced, with almost no dead space on center. This precision was most noticeable on the winding roads outside Napa. 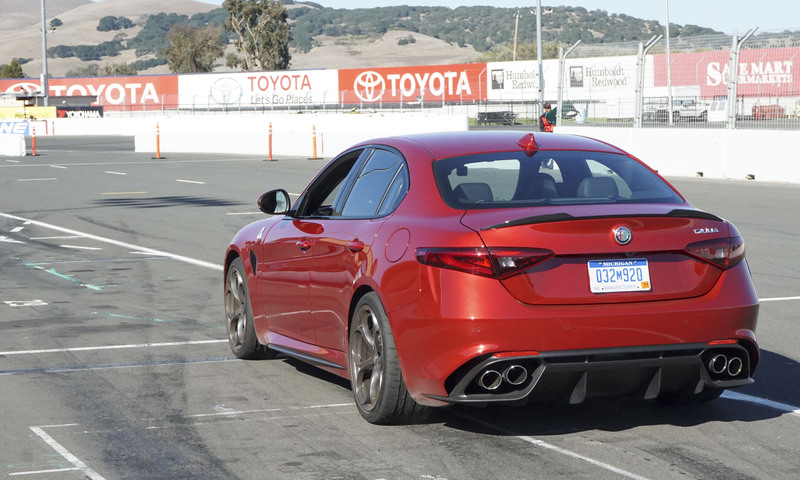 Every tiny input results in a change in direction, which takes some getting used to at first, but ultimately makes the Giulia feel incredibly agile. 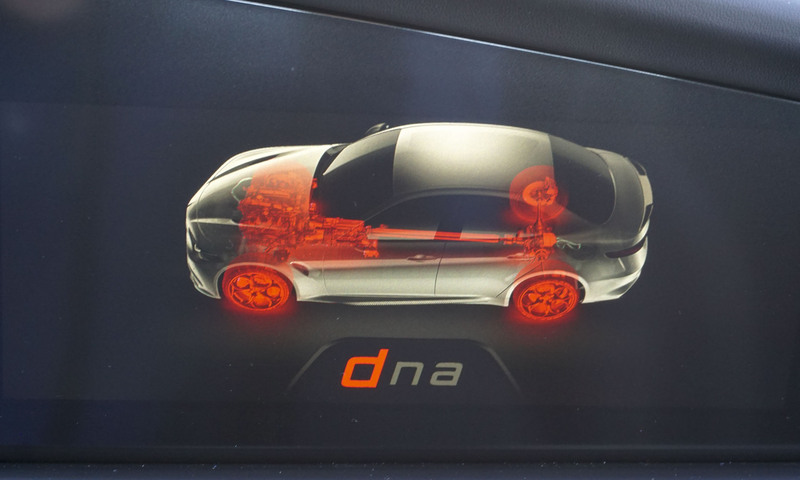 The transmission shift points — along with several other component settings — can be adjusted via the DNA Pro mode selector. Selections can be Dynamic, Natural, Advanced Efficiency and — in the case of the Quadrifoglio — a fourth Race setting. Since Race mode turns off most of the active safety features and this wasn’t our car, we did not use Race mode. 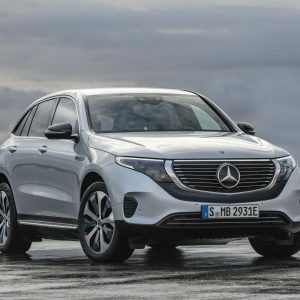 Dynamic mode is certainly sufficient for most drivers and on-street situations — it firms up the suspension, tightens the steering, opens the exhaust and changes shift points to match driving style. When driving the car hard, the transmission holds the rpm high, downshifting as the car slows into turns — at almost the exact point when the driver would have performed the same action. When we slowed due to heavy traffic, the transmission adjusted to the current driving situation, no longer holding high revs or making dramatic downshifts. When the road became rough we switched to Natural mode and the ride became considerably smoother. 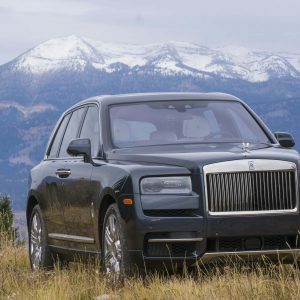 As we were comfortably cruising along in traffic on the freeway, it was hard to believe that this same docile sedan is also the fastest 4-door ever to tackle the Nurburgring. Once we took to Sonoma Raceway it was clear that this car has considerable potential. With strong acceleration, excellent brakes and neutral handling thanks to its 50/50 balance, the Quadrifoglio feels just as at home on the track as it does cruising public roads. 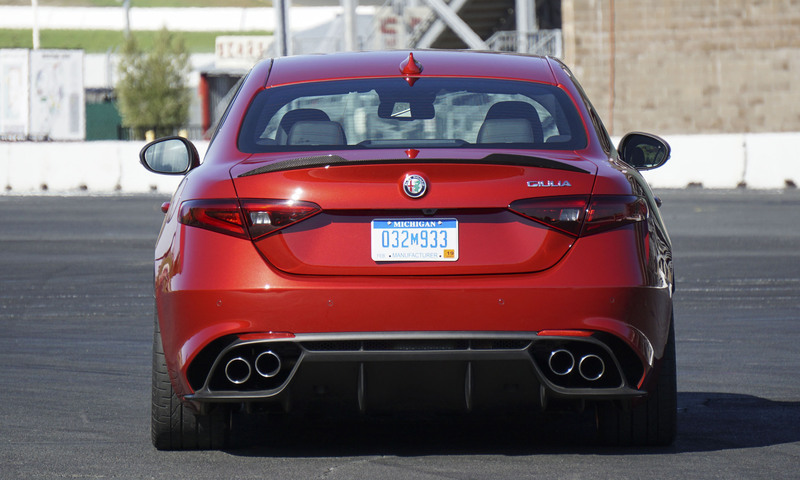 The Giulia has a split personality, and that’s a good thing. Although not as powerful as the Quadrifoglio, we found the Giulia Ti still brings plenty to the party. 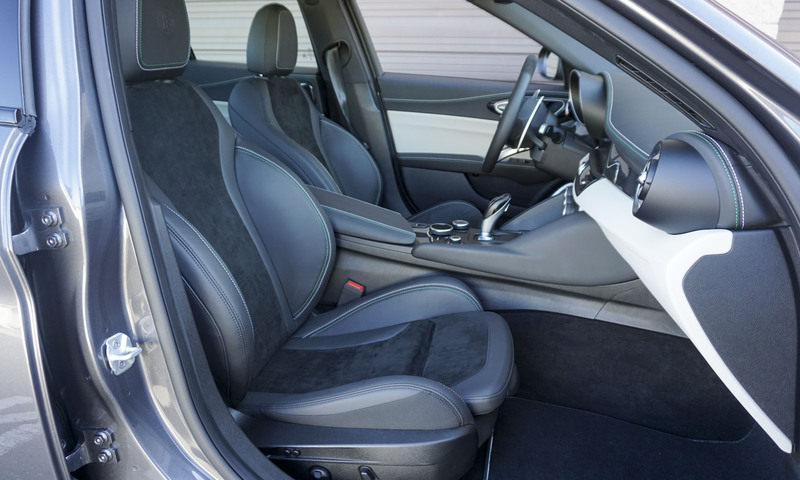 Many will find the seats in the Ti more comfortable compared to the tight-fitting sport seats in the Quadrifoglio, and the turbocharged 4-cylinder engine provides plenty of power. We were pleased to find the same quick-shifting 8-speed automatic in the lesser-powered Ti. The Ti is great fun to drive and will make an excellent lesser-priced option for those wanting to get into a new Giulia. 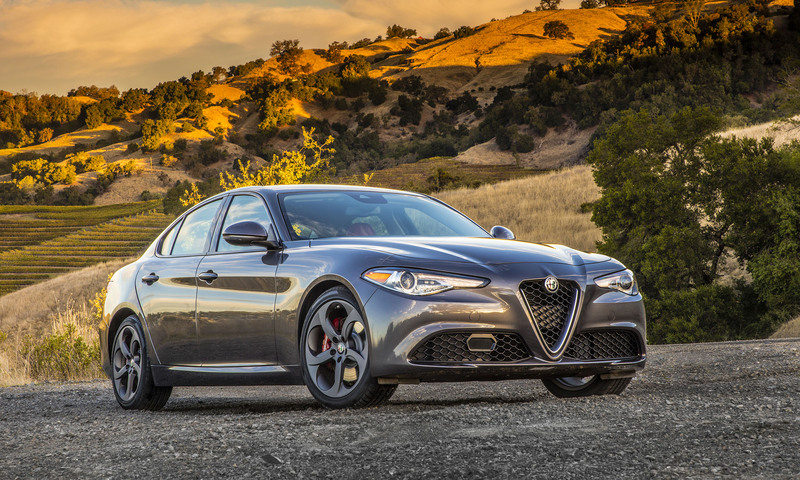 The Alfa Romeo Giulia has a lot going for it. 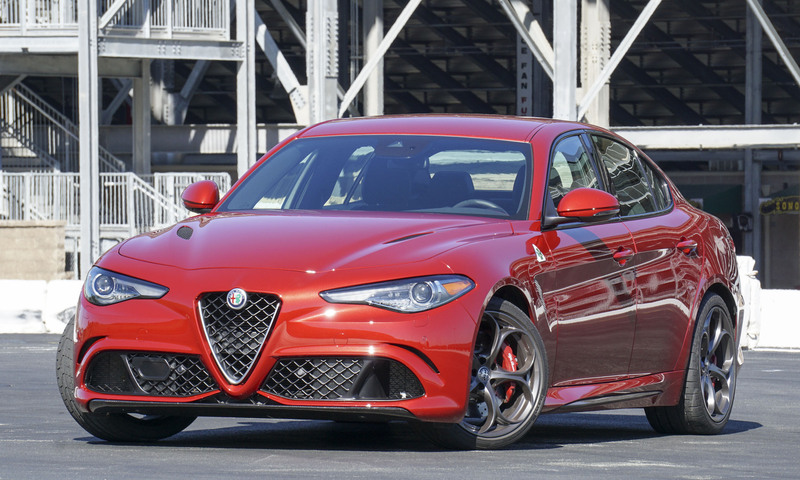 This sport sedan will certainly stand out from the crowd with its attractive Italian styling, and buyers of either the Ti or Quadrifoglio won’t be disappointed in the performance. The biggest hurdle Alfa faces will be attracting buyers who have never heard of the Italian marque, as well as retrieving customers who remember Alfa when its reliability was less than stellar. 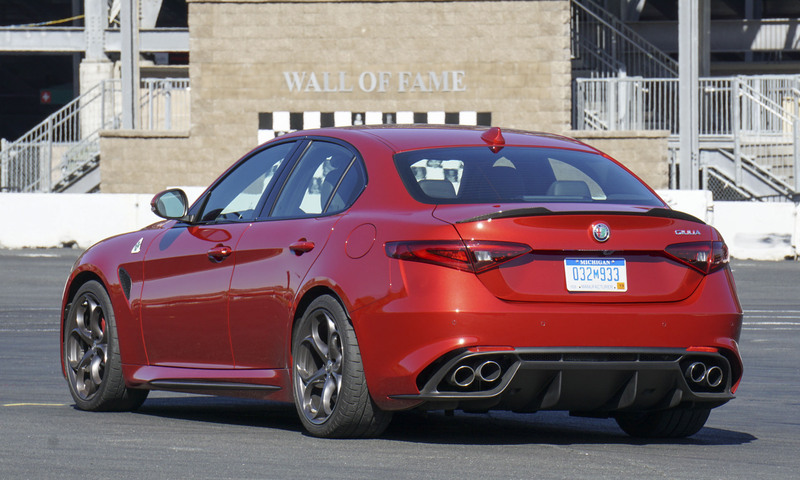 Ultimately the Giulia makes a great choice as a daily driver with impressive — or even extreme — performance. 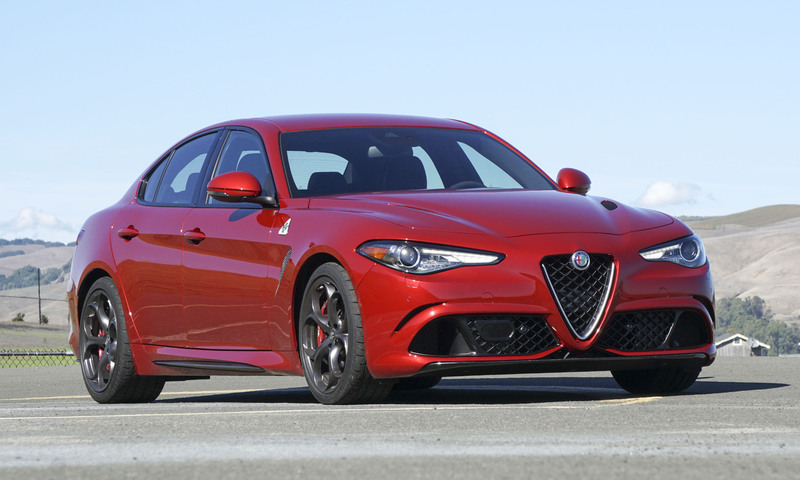 Bottom Line: Alfa’s newest entry is worthy of being branded a true sport sedan. Pros: Very fast; excellent transmission on all trims; comfortable ride.